On January 7, 1610 Galileo Galilei pointed a small twenty-power telescope at Jupiter. What he observed changed the way we understood the universe.Galileo noticed what appeared to be three small stars near Jupiter. The next evening he again observed three faint stars, but they now appeared on the other side of the planet. Over the next several weeks he watched up to four faint stars weave back and forth near Jupiter. Galileo named them the “Medicean Stars” in honor of his patron Cosimo II de’ Medici, but we now know them as the Galilean moons of Jupiter. At first it wasn’t clear to Galileo what these “stars” were, or why they were always found near the king of planets. But Galileo was a patient and accurate observer, and over time it became clear that the motion of these objects followed Kepler’s laws. The same laws that described the motion of the planets around the Sun. Clearly they orbited Jupiter in much the same way as our Moon orbits the Earth. And if moons could orbit a planet, then perhaps it was true that the Earth orbited the Sun after all. With this discovery and his observations of the phases of Venus later that same year, Galileo gave us proof of a heliocentric universe. Earth was not fixed at the center of the cosmos, but rather moved around the Sun just as other planets did. But Galileo’s discovery not only changed our view of the heavens, it also changed the Earth. Quite literally. One of the great challenges of cartography has been determining just where on Earth you are. Determining your latitude can be done by observing the position of the stars. For example, the angle of the “north star” Polaris above the horizon is a good basic indication of your latitude. Determining longitude, however, is a very different matter. The Sun, planets and stars travel east to west across the sky, and so there is no clear point of reference for measuring longitude. To make an accurate longitude measurement, you need an accurate clock you can use to measure when particular stars pass overhead, for example. Since the Earth rotates at a steady rate, a time measurement can be used to determine your position east or west of a reference location. Left: Willem Bleu’s 1650 map of Europe. Right: Robert Janvier’s 1764 map of Europe. Galileo realized that since the moons of Jupiter obeyed Kepler’s laws, they could serve as a kind of heavenly clock. A clock more precise than any human-made clock of the time. So he began to compile a table of eclipses of the Galilean moons. That is, when a particular moon would pass into Jupiter’s shadow or reappear from behind Jupiter. In 1668, Giovanni Domenico Cassini improved upon these tables, creating a time table accurate enough for cartography. For the first time cartographers could make truly accurate longitude measurements. Many of the accepted distance between cities (used since the Roman Empire) were found to be off by hundreds of miles. 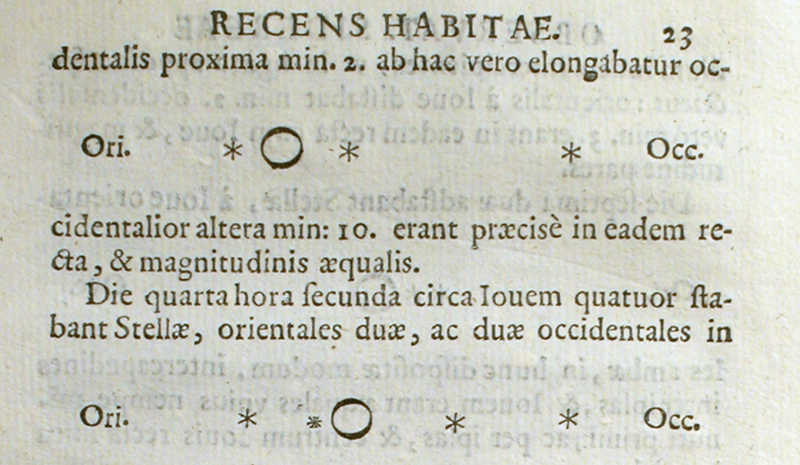 The affect of Galileo’s moons can be seen in the difference of world maps made before and after Cassini’s tables. Soon after Danish astronomer Ole Rømer realized that a delay in the timing of these eclipses when Earth was moving away from Jupiter was due to light having a finite speed (and having to travel an extra distance of one Earth orbit diameter). At the time it was generally thought that light travelled infinitely fast. Because the speed of light is finite and because the universe is only 13.82 billion years old, we can not possibly see further than 13.82 billion light years away (1 light year being the distance light travels in a year). Everything within that distance from us is what we call the observable universe, though often we forget the “observable” part of the name. The moons of Jupiter gave us the size of the universe. A very interesting and enjoyable post. My only disappointment is that it repeats the common fallacy that Galileo’s observations “gave us proof of a heliocentric universe.” Galileo’s discoveries, particularly his observations of the phases of Venus, certainly disproved the Ptolemaic/Aristotelian model of the universe (according to which all the heavenly bodies orbited the earth). But they were entirely consistent with other geocentric models, such as the one proposed by Tycho Brahe (under which the planets orbited the sun, while the sun and the moon orbited the earth). In fact, the weight of scientific evidence actually favored Tycho’s system over heliocentrism for a period of time even after Galileo died; it wasn’t until later in the 17th century that the gradual accumulation of evidence swung the balance the other way, and actual “proof” came only in the 18th and 19th centuries (with the discovery of the aberration of starlight and detection of stellar parallax). An excellent recent book on all of this is Christopher Graney’s “Setting Aside All Authority: Giovanni Battista Riccioli and the Science against Copernicus in the Age of Galileo.” Anyway, I’m very pleased to have discovered the site and look forward to checking back. Yeah, the verification of the heliocentric model was not simply cut and dry. But by the time the “proof” of stellar aberration and parallax came along there was little doubt among the scientific community that the Earth did indeed move around the Sun. True, Galileo’s observations were compatible with Tycho’s model, but Tycho was incompatible with Kepler and Newton. When scientists write history, they revise heavily.